Offering excellent fingertip sensitivity, flexibility and grip, the Ejendals Tegera 456 Level C Cut Resistant Gloves are ergonomically and functionally developed for assembly line tasks. With water- and oil-repellent palms, as well as a food-safe design, they are particularly suited for food preparation and processing applications. 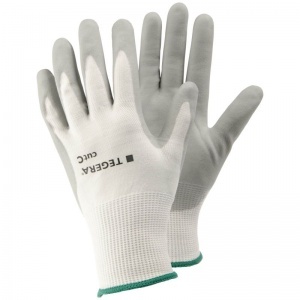 The Ejendals Tegera 456 Gloves feature Ejendals' proprietary Cut Resistant Fiber (CRF) technology, which is designed to provide exceptional dexterity, a quality that is not usually present in high-performance cut protection gloves.